The guy who plays Billy Bones reveals the burn-the-ships training program that turned landlubber actors into seafaring marauders. The ships rise out of the South African grasslands like remnants of a dream. You can’t miss them from the highway. On one side is a shantytown -- a collage of corrugated tin and pastel-painted plywood — and on the other, pirate ships. Two and a half full-scale schooners rest three miles from the sea on the back lot of the Cape Town Film Studios. I’ve traveled 10,000 miles and 10 time zones to a place where the idealized fantasies of the past and stark realities of the present collide. Where actors endure the sort of barbarous workouts of which legends are made. Before they were pirates, the male cast of Black Sails, now in its second season on Starz, first had to survive a boot camp — a six-week crash course designed to chisel them into the sort of sea-worn sailors who toiled in the Caribbean three centuries ago. “We wanted the characters to look like they lived on a ship,” says Toby Stephens, who plays Captain Flint. “They hauled ropes and climbed ropes and lived a physical life. We wanted it to look like we didn’t have an easy life.” For the first month, the actors had it anything but easy. They fasted intermittently, eating (meat, eggs, and vegetables exclusively) only during an eight-hour window from noon to 8:00 P.M. With intense workouts scheduled for 10 A.M., body fat was their only fuel source. The mastermind of this program is James White, 30, a former attorney and current disciple of Gym Jones — the system most associated with the cast of 300. Sensing an opening in the South African market for a combination of strength training and cardio conditioning, White gave up the law three years ago and opened Roark Gym (named for The Fountainhead’s hero). Accustomed to bodybuilding gyms filled with phalanxes of contraptions, I am initially bewildered by Roark Gym. Benches and racks line one wall, cardio machines line another, but the vast space in between is as barren as a dance studio. “Is this the gym?” I ask. White laughs. Of course it is. 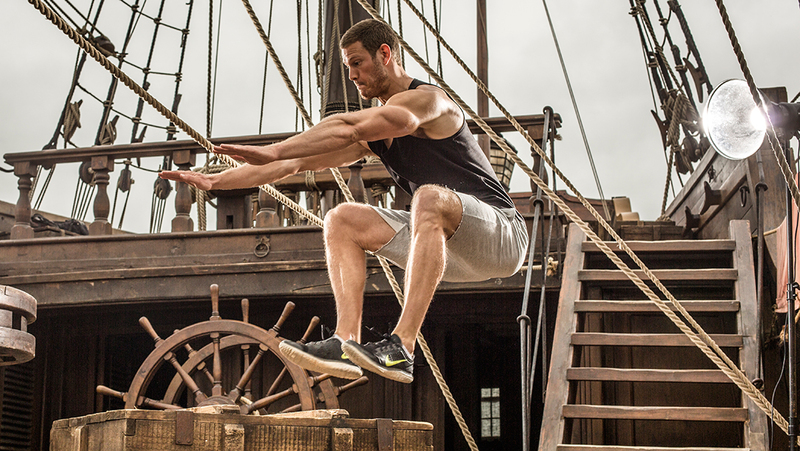 When Tom Hopper and his Black Sails castmates are present, as they are nearly every day, they fill that void doing box jumps and pullups and “ball slams to hell” and pushing prowlers loaded with 100 pounds as they sprint from one end to the other and back again, all while White drives them onward, sometimes spouting the gym’s motto: Burn the ships. “That initial shock [of the boot camp] was necessary, because after that the bar was set so high that it changed everything and made it easier to work with them,” White explains. “What they thought was hard work before has changed, so they have a very lofty idea of what hard work is now. What we do is similar to CrossFit. But we use more equipment, and we’re focused less on the Olympic lifts.” After a standard warmup, the Black Sails program stresses strength in compound lifts like bench presses, squats, and rows. This is typically followed by 20-30 minutes of high-intensity conditioning. Though White favors “athletics over aesthetics,” he knows the latter will follow the former. The results are tangible in scene after sweaty scene of Black Sails. That’s why when I meet Tom Hopper, who plays Billy Bones, we’re not in Roark Gym. We’re on the deck of the 140-foot, meticulously accurate, pirate schooner The Walrus, the biggest and baddest of the Cape Town Film Studio ships. He is, initially, wearing a “Burn the Ships” T-shirt over his 6’5”, 220-pound frame. Growing up in Leicester, England, Hopper was passionate about rugby. But when injuries sidelined him at 16, he tried theatrical acting. “I found that making an audience laugh was the same kind of adrenaline rush as scoring a goal,” he recalls. He attended drama school and earned theatrical and TV roles. Meanwhile, he grew increasingly muscular. “As a younger kid playing rugby, I was really skinny, so I started lifting weights to get bigger. I discovered I had to eat a lot of food, and my poor mother had to cook a lot of chicken. I went through a phase of trying to lift as much as I could like a rugby scrum—with zombies. “Whoa! That thing is bloody brutal! I sweat just thinking about it.” Billy Bones is missing from the storyline at the beginning of season two, so Hopper had some extra time on his hands. White wanted him to try the 222 as a means of staying focused on a goal. Currently, Hopper and his wife Laura spend five months of each year at their home in England and the other seven in Cape Town, where Black Sails is shooting season three. One question remained unanswered until the cast dinner at a posh restaurant in the hilly wine country beyond the studio. What’s the story behind the Roark Gym motto—burn the ships? Did it portend something ominous for those schooners on the studio back lot, or was it some pirate saying from centuries lost? Neither. And yet it is attributed, perhaps apocryphally, to a seafaring marauder from long ago. Hopper explained over ostrich sausage and grilled squid that just before Spanish conquistador Hernán Cortés began his against-all-odds conquest of the Aztec Empire in 1519, he gave an order that signified to the 600 men aboard his ships there could be no turning back. They had only two options: win or die trying. Therefore, their means of retreat would be eliminated. Five centuries later, Hopper carries that battle cry into every workout, pushing him ever forward. Typically the primary focus one day (ex. : heavy squats) is the secondary focus the following day (ex. : jump circuits). Pushing is balanced with pulling. Work is “hidden” via techniques like rep ladders. Participants train in groups to drive each other.